rambles from a girl who loves books and stuff: I LOVE BOOKS #3: Giveaway! Hello, my book loving fiends! This week we're doing something a little different! I'm still in the midst of reading The Darkest Minds by Alexandra Bracken, so I thought it would be a really good opportunity to giveaway one of my favorite books of the year. I featured this book in my first I LOVE BOOKS post, and I'm excited to give a copy away to some fiend just waiting to devour this book! 1) What super power do you wish you had? 2) Why are you excited to read this book? Names will be cobbled together and a winner drawn randomly! You can comment more than once, but only one comment counts. Leave a way for me to contact you if you win! A tumblr username (asks open), a twitter name, URL, email--any way I can get a hold of you if you win. That's all, book fiends! Leave your comments and GOOD LUCK! Oooh, one of my favorite personality questions! If I had any superpower, it would be an even tie between the ability to talk to all animals, or the ability to shapeshift into any animal. I still can't decide! I would love to be able to fly (as fast as I want) so I can travel the world and see everything everywhere! Thanks for hosting this internationally :) I would love to be able to fly or to become invisible, I can never decide which would be better! tough one... hmmm probably have a super brain and be able to learn anything super fast. A bit like Chuck... that would be pretty awesome! I would love to be able to communicate telepathically with people/animals. I want to read this book because it sounds AMAZING and I like the cover. If I could have any superpower, I think it would have to be telekinesis, to move things with my mind. I would say telepathic, but only if I could REALLY control it and only read minds when I want to. Every book I read with a telepathic character, it is just bad for them which is why I stick with the safe, and exciting =), ability of telekinesis. However, the main character's power in Pivot Point also sounds awesome, but not as exciting in the everyday. 2) I've been hearing people rave about this book for weeks, so I either need to win it, or get some book-buying money, stat! I'd love to be able to fly! The view would be so beautiful! Thanks for hosting the giveaway!! Great question! Hmmm, I would love to be able to time travel – is that a superpower? – or shape shift. I've been wanting to read this book FOREVER; it sounds so good. The history/relationship between the good guy and the villain is something I always find fascinating. Thanks so much! I'd really want teleportation as a superpower. It would make life so much more convenient and I'd be able to see friends that live far away in the blink of an eye. My superpower would be refills! The ability to refill anything: my plate, my bank account. Works well in reverse: deplete my enemy's gas tank, etc. I would have the power to stop time, since I'm such a procrastinator and I have some weird sleeping patterns. It would be so useful just to go "man I could use a nap" and just freeze time so and hour. 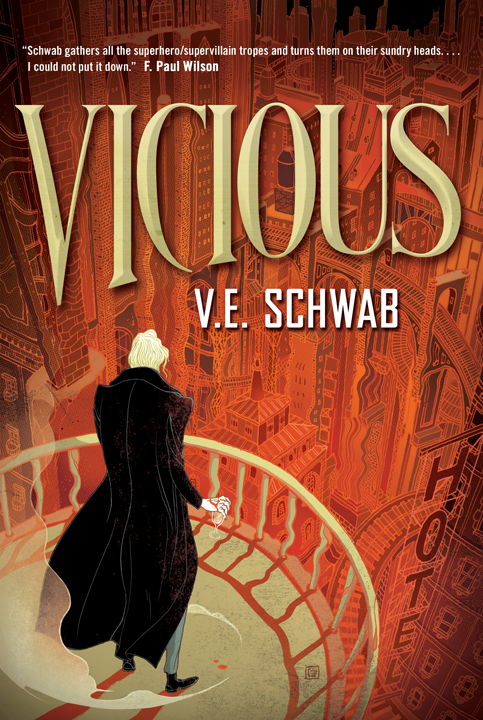 Also, I've read both The Archived and the Unbound and they were both amazing, I'm very interested to see what Victoria Schwab does with superheroes. I'd love to be able to move things with my mind, I think that would just be the coolest power to have. I'm so excited to read this book because I've read some of the author's other books and just loved them. I would want to be able to tell the future so I'd have sure things when it came to betting on basketball games. If I could have a super power I would want it to be control over time or teleportation, I think. It is a hard question. cardiac arrest need help from a professional as fast as possible for the best survival rate, I could make sure they got there without time passing. Also I could safe people from being hit by a car, or things like that. But Teleportation is super cool too. I could travel the world and see all the amazing places it got to offer. (Without spending a lot of money). Discover places that are yet unknown. See important events from the actual place. And if my country would ever try to take away our rights I could help the resistance in a super stealthy way. And I guess it could safe lives to, like the cardiac arrest example or other stuff. So I don't know what I want for a superpower. Maybe both if I could. It would be awesome. I would like to have the power to speak to all animals, and I am excited to read this book because the synopsis sounds really interesting; I've never read a superhero story before, and this is an interesting take on the whole superhero vs. Villain dynamic. I really love to see how the book turns out, and I simply love stand-alone novels. I hope it will remain as a stand-alone.